Alexander Fu Sheng lets loose in Chinatown Kid. The Skinny: Framed on drug charges, a poor boy immigrates to the United States to escape prosecution, only to find himself caught in a turf war between two rival gangs in San Francisco's Chinatown. Although considered by some to be Alexander Fu Sheng's signature picture, this version of Chinatown Kid is a bit too muddled and choppily-paced to live up to the film's "classic" status. Even in this truncated form, it's an enjoyable picture sure to entertain fans of old school martial arts flicks. Shaw Brothers superstar Alexander Fu Sheng stars as Tang Dong, a country bumpkin with a heart of gold and fists of steel in Chinatown Kid, a cross-continental action flick from director Chang Cheh. At the beginning of the film, Dong works for his grandfather hawking orange juice on the streets of Hong Kong. His knack for squeezing oranges with his bare hands catches the interest of Xu Hao (Johnny Wang Lung-Wei), a local fat cat, whose snazzy accessories spark Dong's dreams of attaining money and success. Somehow, this desire for riches leads to a friendly sparring match between the two, but things soon turn sour. In fact, the situation spirals so out of control that Xu Hao actually frames Dong for drug possession! With the cops hot on his trail, Dong flees by boat to the United States. Once there, he meets Yang Jian-Wen (Sun Chien), a student on scholarship to an American university. The two men become fast friends when they both apply for the same dishwasher job at a local Chinese restaurant. The duo experience the ups and downs of busboy life together and plenty of male bonding ensues, but the good times end when Dong is fired for clashing with some gang members trying to extort protection money from the restaurant's hapless owner. Luckily for Dong, his martial arts abilities impress Long (Philip Kwok), leader of the White Dragon gang. It seems that the White Dragons are the bitter rivals of the thugs Dong fought, so Long happily takes our hero under his wing, giving him a prime bodyguard position within his organization. At this point, the narrative shifts abruptly as Dong becomes a cigar-chomping mafia-type decked out in a pimp suit. Despite his external changes, Dong is still a good kid at heart, eager to catch up with old friends and tell them about his new job. Unfortunately for Dong, at every turn he seems to get grief for his new "thug" life. The naïve Tang Dong believes that Long is really a benevolent businessman looking to stamp out gangs from his community. What Long doesn't realize is that the White Dragon boss is actually the man responsible for the influx of drugs into Chinatown. Meanwhile back at the restaurant, Jian-Wen is still slaving away, trying to balance school and work. Stressed beyond belief, he almost succumbs to the allure of drugs, but is stopped (conveniently) by his old friend, Dong. Angered by the situation, Tang Dong becomes an anti-drug vigilante, combing the streets for drug dealers. While his employer was content to allow him to bust up competing drug rackets, when the boy's crusade starts to hit a little too close to home, Long draws Tang Dong into a trap. And that, my friends, is when IT ALL GOES TO HELL! Cue martial arts smackdown. Overall, Chinatown Kid is a fairly entertaining action picture. It's heralded by some as Alexander Fu Sheng's signature film, and it's not hard to see why. Fu Sheng makes for an infinitely likable protagonist. Although he doesn't exactly tread any new ground with the stock character of Tang Dong, Fu Sheng imbues him with a simple, dunderheaded charm that makes the proceedings worth watching. Before I commence with my critique of the film, it's important to recognize that the version released on DVD by Intercontinental Video Limited is severely chopped up. It's missing several fight scenes, a key plot point, a cameo by Kara Hui Ying-Hung, and a whole character! In its defense, the company has said that this was the only print of the film made available to them. It is also reported that while certain international versions restore these elements plus the film's original, darker ending, they are also missing certain scenes available in this cut. Thus, no uncut Cantonese language version exists outside of fan-made "director's cuts." So, although I fully recognize that this version of the film is incompletethus explaining away some of my criticismsI will review the film as is. If a longer version becomes available, I will happily revise my evaluation. Now back to the review. One of the main problems with this version of Chinatown Kid is its inability to capitalize on its initial double focus. This review suggests that Tang Dong was the primary character at the start, but in fact, the actual narrative starts off following the stories of both Tang Dong and Yang Jian-Wen as their lives intersect and diverge in San Francisco. And for a time, the film actually does pursue this route, but as the plot kicks in, Jian-Wen soon becomes a subordinate character, and whatever promise his storyline held is basically forgotten. Clearly, Fu Sheng was the star of the show from the first reel (he's the Chinatown Kid after all), so why bother trying to elevate a secondary character if you're not going to stick with it? And really, if the film wanted to explore the evils of drug abuse, then the filmmakers should have made the goody two-shoes Jian-Wen into a certifiable junkie, not just a guy about to give into peer pressure. The whole subplot is just a little too "After School Special" to be taken seriously. Another big problem is the editing. In several spots, the film doesn't seem to follow any logical progression. Events happen, but not necessarily in connection with what occurred in the previous scene. Why did Xu Hao frame Tang Dong? Why are certain people fighting in this scene? How did Tang Dong suddenly become infamous in Chinatown after just one scene? Those and other plot details are left curiously obscure in this version. The choppy editing extends all the way to the finale, and despite all the martial arts mania that has gone before, Chinatown Kid concludes on an unexpectedly reserved note, not just for a kung fu film, but particularly for a film directed by Chang Cheh. If you thought the Mainland Chinese ending of Infernal Affairs was lame, you ain't seen nothing yet.  A full rundown on the differing versions of Chinatown Kid can be found here. 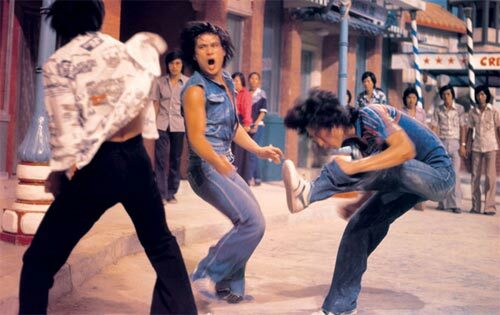  Although some shots of San Francisco are included, Chinatown Kid was filmed predominantly on the Shaw Brothers soundstages. image credit: Intercontinental Video, Ltd.